We will be having a meeting on fire safety, CPR training, and the Heimlich Maneuver on Monday, February 8th, conducted by the Palm Beach County Fire Department. The meeting will be held at 2:00 p.m. in the clubhouse, and we will serve cookies and coffee. I hope you can attend as this will be good information. The meeting will last approximately 1 1/2 hours. If you have any questions, please contact me at 561-328-8326.
staring Will Ferrell, James Caan, Bob Newhart, Edward Asner, Mary Steenburgen. PG, 97 minutes. Thanks to Frank Randall who submitted a recent photo of the new pool deck – in process. Looks great! What do you think? I would like to thank all 27 Boundbrook owners who attended the informational meeting regarding the pool deck pavers. 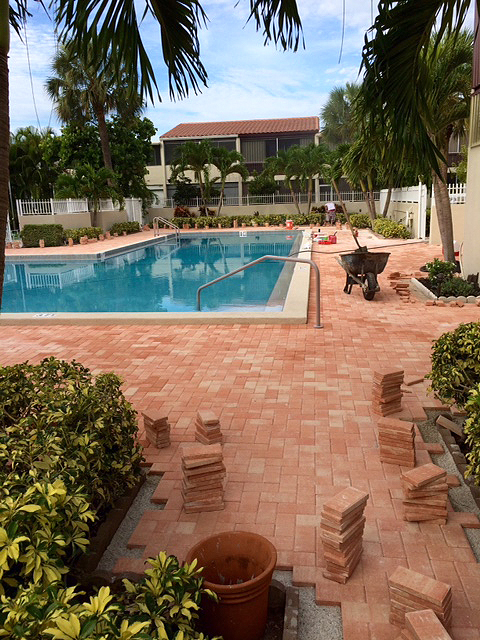 All questions were answered and Duane Stuart shared information pertaining to temperature readings taken on paver samples here and pavers installed at another condominium pool deck location. It was agreed at the meeting to keep temperatures on the new pavers to a maximum of 115 degrees. Our pool deck currently has a reading of 112 degrees. For all owners currently residing at Boundbrook, a book with available colors is in the clubhouse along with other products pertaining to pool deck installation for your review. For owners who have already left to go back north you can go online to “Gem Pavers.com” for color selections. Colors listed under White Cement are the ones to review for selection. Beginning May 6, a notice will be placed on the cluster bulletin boards for you to choose three color selections that you like the most. Please write your name and your 3 color choices. For the owners who are away, please go online and pick your three choices and then contact your cluster director with your choices. He or she will then add them to the bulletin board notice. At the May 28th board meeting we will calculate the top three color choices. After this we will apply the samples to our deck as they will be for final installation and leave them there to be viewed for the month of June. Then at the June 25th board meeting we will decide our final choice according to your selections to be presented to the directors for approval. Again, thank you for your participation in this matter. Check out The Exchange for a beautiful cabinet that will be given to the first person who responds. to benefit the . . .
MOVIE SUMMARY: Skylark (James Franco) and Aaron Rapoport (Seth Rogen) are two celebrity tabloid TV show hosts of “Skylark Tonight.” Hoping to legitimize themselves as journalists, they land an interview with North Korean dictator Kim Jong-un, a fan of the show. As they begin their travel to Pyongyang, their plans soon change when the CIA recruits them, perhaps the least qualified candidates imaginable, to assassinate Kim Jong-un. RSVP to Allan Knights, or show up on the night of the movie. MONDAY NIGHT AT THE MOVIES is a success! Averaging more than 30 people attending, movie night has become as much a social event as it is a monthly food drive benefiting the Palm Beach County Food Bank. So far, we have collected 161 pounds of non-perishable food; our goal for the first year is 1000 pounds (1/2 ton). If you haven’t yet joined us, please consider it. REMEMBER: price of admission is a donation of non-perishable food items. The Gift Committee was set up to coordinate and encourage gifting whereby we in Boundbrook would be able to fund improvement initiatives that are outside our operating budget. A series of events this season, the Soup and Salad, the Spaghetti Dinner, the Rummage & Bake Sale and most recently the Pool Picnic, have contributed to a dedicated project account that will support construction of a much needed canopy to extend Club House space. Not only is it impressive that key people have organized fundraising initiatives, but that they have collected so many willing and hard working supporters. These events have been a great successes thanks to the much appreciated support received from our community. With additional specified donations, the canopy fund now stands at just under five thousand dollars. Although the concentration has been on a special project so far, it is now time to focus on the other component of gifting which is specific memorials. To this end, Jed Patrick and Gordon Whitten have joined the Gift Committee and along with Frank Randall will be focusing their efforts on reaching out to residents that would like to establish named memorials. Jed, Frank and Gordon will devote their energies to linking donors with projects that will enhance Boundbrook while providing a means of honoring people that are or have been an integral part of Boundbrook. Frank very aptly defined memorializing as honoring an individual or serving to preserve a remembrance. Memorials can contribute either to special projects such as the Canopy Fund or they may be far more personalized and uniquely suited to the individual. A temporary record of memorials will be kept in the Club House until a project has been completed at which point a permanent recognition will be prepared. If you are interested in sponsoring/organizing a fund raising event, talk with any member of the Gift Committee. (Allan Knights, Jan Kalmbach, Vasilia Laskaris, Sandy Marr, Kirk Murray, Jed Patrick, Frank Randall, Sue Sorelle and Gordon Whitten). For specific named memorials go directly to John(Jed) Patrick, Frank Randall or Gordon Whitten. There is a new Tab on the Menu entitled “The Exchange“. The page was created to give Boundbrook owners a space to advertise items they may be giving away or selling ONLY within the Boundbrook community. Please read the information that I have posted on the tab, and follow the procedure that I have set up in order to preserve privacy. Items for sale etc. will have separate sub-tabs that will be labeled with the name of the object. For example, currently one sub-tab lists Blinds for sale; that page has a description and photos of window blinds that an owner is selling. Check out The Exchange. If you have any questions contact me directly. Welcome to Boundbrook’s blog and social network. Feel free to post comments or suggestions at any time.